Students will track the food they eat for one week. They will understand the basic nutrition requirement for healthy living and know what a calorie is and what their recommended daily calorie intake is. 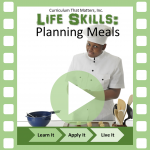 They will then learn how to plan and price a meal plan, learn about weights and measures, and will learn how to double recipes and how to cut them in half.